Hailed as Italys The Fault in Our Stars, this Italian bestseller is now available for the first time in English. "I was born on the first day of school, and I grew up and old in just two hundred days . . ."
Sixteen-year-old Leo has a way with words, but he doesnt know it yet. He spends his time texting, polishing soccer maneuvers, and killing time with Niko and Silvia. Until a new teacher arrives and challenges him to give voice to his dreams. And so Leo is inspired to win over the red-haired beauty Beatrice. She doesnt know Leo exists, but hes convinced that his dream will come true. When Leo lands in the hospital and learns that Beatrice has been admitted too, his mission to be there for her will send him on a thrilling but heartbreaking journey. He wants to help her but doesnt know howand his dream of love will force him to grow up fast. Having already sold over a million copies, Alessandro DAvenias debut novel is considered Italys The Fault in Our Stars. Now available in English for the first time, this rich, funny, and heartwarming coming-of-age tale asks us to explore the meaningand the costof friendship, and shows us what happens when suffering bursts into the world of teenagers and renders the world of adults speechless. Alessandro DAvenia holds a PhD in Classical Literature, and teaches Ancient Greek, Latin and Literature at a high school in Milan. 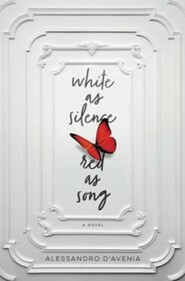 White as Silence, Red as Song was his first novel,published in Italy in 2010. It sold a million copies in Italy, has been translated into over twenty languages and was released as a film in 2012. Alessandro has since published four more books, the latest of which, Every Story is a Love Story, was published in October 2017. I'm the author/artist and I want to review White as Silence, Red as Song: A Novel - eBook.